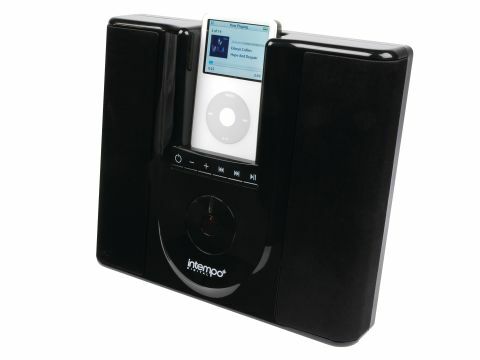 For an iPod speaker system to be deemed '2.1' it must have a subwoofer, but instead of offering a separate bass speaker, InTempo has hidden it in the rear of the IDS-03. It helps explains why this sleek black system is so big. Also selling in white or silver and effortlessly simple to operate, the IDS-03 offers some novel features. As well as charging an iPod when it's docked in the mains-powered unit, it's possible to attach the entire system to a PC via a mini USB or Firewire cable for synching with iTunes while the iPod is still docked. New iPods (5G) and Nano rely only on USB, while older versions use FireWire. There's quite a haul of connectivity for such a product, making the IDS-03 impressively versatile. Maximum usability is aided by a series of inserts, spacers and docking covers that cater for every iPod ever invented - bar the Shuffle. Resplendent in bass, Ryan Adams' The Sun Also Sets encoded at 192kbps feels the benefit from that built-in subwoofer although there is some hissing at high volumes as well as some buzz and general muffling. That said, the volume on the InTempo DS-03 goes higher than most docks here and its combination of excellent stereo separation and bass levels earn it our laboured respect, but it lacks much precision.